The Item Master page allows you to control all of the attributes and settings of your items. You can edit all information about your SKUs, add custom fields, edit your SKU or Item IDs, add images, set restock levels—both restocks for your entire inventory as well as restocks by specific locations—and manage cost data, unit conversion rates, and more. The search box and item forward and item back buttons make it easy to search and step through items. 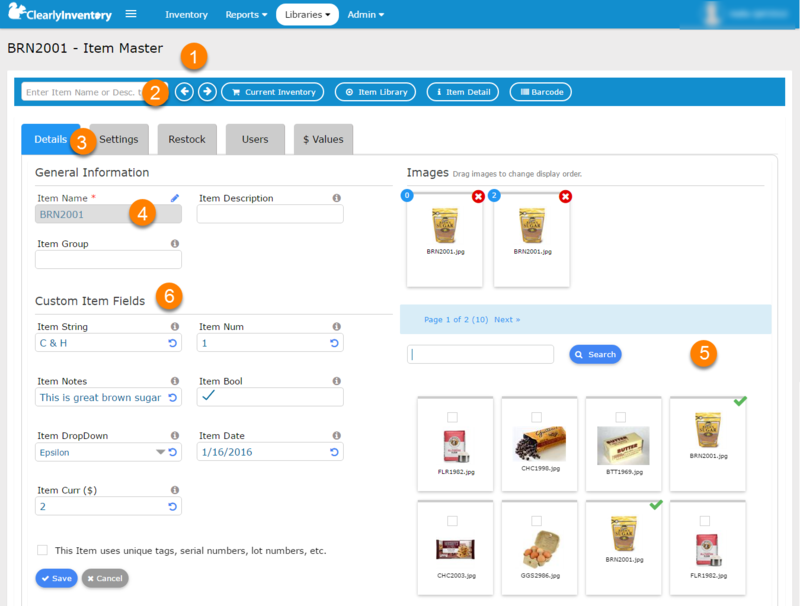 This allows you to perform tasks related to your item attributes and browse through Item Master pages. Associate images from your image library with your items, right on the Item Master page. You can associate multiple images with a single item. You can also upload many images at once in the image library. You can create custom item fields to capture only the information you need to track about your items. Most other software products throw a bunch of fields at you—some that are helpful, but some that aren't needed. Here you capture only the information that's important to you. Need to change a SKU number, Part Number, or Item ID? It's easy with Clearly Inventory. Simply click the "Edit" button, change the value, and it will automatically change the number everywhere in the system. You can also delete items that are no longer in use.